The Italian big boat racing season fires up over 19th-24th May with a new look Rolex Capri Sailing Week. Capri – The Italian big boat racing season fires up over 19th-24th May with a new look Rolex Capri Sailing Week. This year, for the first time, the Maxi yacht fleet is joined by the international grand prix 52 fleet with Rolex Capri Sailing Week being the opening event of the class’ 2014 European circuit – the Barclays 52 Super Series. Organised by the International Maxi Association (IMA) in collaboration with the Yacht Club Capri (YCC), the event will comprise separate courses for the Maxis and 52 Super Series over the first three days. While the 52s will be racing windward-leewards on the waters off Capri, the Maxis will be competing on the Volcano Race. Provided conditions allow, this will take the Maxis some 130 miles south to the Aeolian Islands north of Sicily, famous for their active volcanoes such as Stromboli, before returning to Capri. 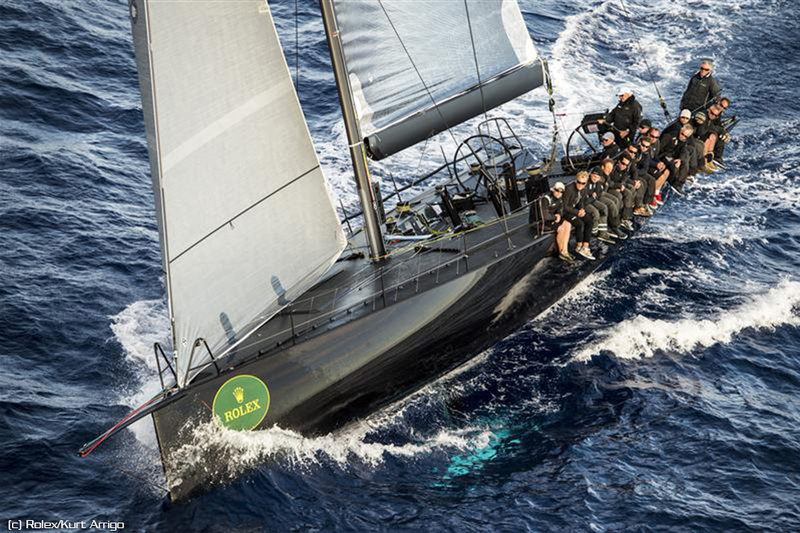 For the second half of Rolex Capri Sailing Week, the Maxis will join the 52 Super Series sailing windward-leewards. The prize fight in the Maxi fleet will be between the racing Mini Maxis, in particular the Judel Vrolijk 72 near sisterships, Jethou and Robertissima III. Roberto Tomasini Grinover, owner of Robertissima III, has similar sentiments about the idyllic island perched off the Sorrento Peninsula, although he admits he’s never sailed out of Capri itself. “It will be a very nice event,” he says. As to the Volcano Race, he hopes they won’t have a repeat of last year’s Rolex Middle Sea Race when they were becalmed off Stromboli. Because five of Robertissima III’s key crewmen will be competing in the 52 Super Series, the team will feature some world class replacements for this regatta, including America’s Cup legend Paul Cayard and former Team New Zealand helm Cameron Appleton. However Jethou is no less well stocked in this respect, with four time America’s Cup winner Brad Butterworth calling tactics. Both boats are relatively new for their crew. The Jethou team only raced their boat (ex-Stig) for the first time at Gaastra PalmaVela last week, while the first outing for Robertissima’s (ex-Rán) was the Rolex Middle Sea Race last autumn. The Hungarian 60 footer Wild Joe is another Rolex Capri Sailing Week regular. “We like it very much. It is a nice event and a beautiful place,” says skipper Marton Józsa. “We are the smallest boat in this fleet and we’re up against some top boats and the top teams, but it will be interesting for us and under IRC we have some chance”. Also competing in the Mini Maxi class is the former Abu Dhabi Ocean Racing VO70, recently acquired by Frenchman Hubert Wargny and renamed Villa Saxe Eiffel, with a crew including Whitbread Round the World Race winner Lionel Pean. If conditions are strong, the French VO70 could well be nipping at the heels of the biggest boat in the Maxi fleet, Igor Simčič’s European-flagged 100ft maxi Esimit Europa II, where multiple Olympic medallist and America’s Cup winner Jochen Schümann will be calling the shots tactically. The racing fleet is joined by a number of cruiser racers including the classic Swan 65 and 651, Giuseppe Puttini’s Shirlaf and Austrian Marietta Strasoldo’s Luz Am Meer and Jeremy Pilkington’s much travelled Baltic 78, Lupa of London. The Maxi fleet will be divided up into Mini Maxi (18.29 – 24.08m) Racing and Racing/Cruising and Maxi, for yachts of 24.09 – 30.50m. Nine boats are entered in the Barclays 52 Super Series with the favourites being the American Quantum Racing, victors of the 52 Super Series overall last season and skippered by America’s Cup winning helmsman Ed Baird. They will be up against the local heroes on Alberto Roemmers’ Azzurra on which Vasco Vascotto is calling tactics. However all eyes will be on the latest addition to the fleet, the brand new Brazilian entry Phoenix, skippered by former Star sailor Eduardo de Souza Ramos. As ever at Rolex Capri Sailing Week, a magnificent social program is being laid on, including a Rolex reception at the Grand Hotel Quisisana on Sunday, 18th May; the Rolex Owners’ dinner on 22 May and the ‘Canzone del Mare’ evening on Friday 23th May.